You will earn 135 WayPoints for each product that you purchase. There is never enough space on any model railroad to fit in everything we want. But working some curved turnouts into your design will go a long way to giving you some extra space! Commercial curved turnouts are notoriously troublesome. Curved turnouts built using Fast Tracks tools operate trouble free as are able to hold the high tolerances needed for a smoothly operating curved switch. We have spent a lot of time determining the most popular combination of radii to offer on our line of HO curved turnout fixtures. Our curved turnout fixtures are designed around the "bent turnout" principle, that is, we've started with a standard #10 straight turnout, and using some sophisticated CAD software "bent" it to an outside radius of 36"R (914.4mm). The inside radius of 30"R (762mm) is a product of that process. As the inside radius is actually made of 3 different radii, we've calculated an average radius from those sizes and state them as the inside radius. It is safe to rely on that number as an accurate inside radius in your track planning. Hand laying your own HO #10 code 100, 36" outside radius and 30" inside radius (914.4mm/762mm) curved turnouts is not as hard as you might think! Tools and technology designed and manufactured by Fast Tracks now make it possible for you to build your own high quality, NMRA compliant curved turnouts. Build curved turnouts that not only look great, but will completely eliminate track related derailments and frustration. Can Be Built Quickly - Build a curved turnout in less than an hour! Each assembly fixture can be used to build right or left hand HO #10 code 100, 36" outside radius and 30" inside radius (914.4mm/762mm) curved turnouts. 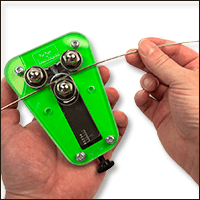 Building curved turnouts using Fast Tracks tools and supplies is not much different than building straight turnouts and does not require any special skills. The only real difference is that the rail is curved, so you may want to consider purchasing one of our Rail Rollers which will make it very easy to bend rail into smooth and consistent radiuses. 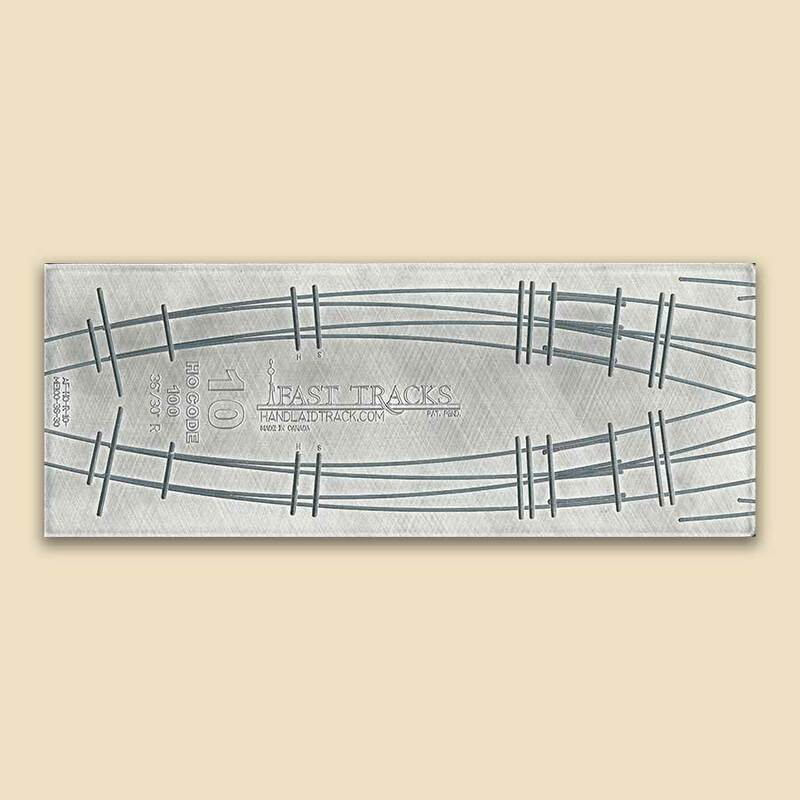 As Fast Tracks curved turnouts are essentially straight turnouts that have been curved, this means that the frog is also curved, but still a standard #10 turnout, which means that you can use our standard PointForm tool to construct the frog. 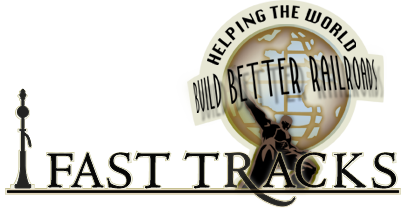 If you order a Fast Tracks assembly fixture, we highly recommend that you consider including the PointForm and StockAid points filing tools shown in the option list. This will make the construction of the switch and frog points much easier. You may also want to consider including some CopperHead PC Board ties and our matching Laser Cut QuickSticks to your order. Unlike ready-to-run turnouts, the stated radiuses for Fast Tracks curved turnouts are very accurate. Default Turnout Length 16.7" (424.2mm) This is the length of the turnout on the QuickSticks. Measured from end tie to end tie. Minimum Turnout Length 12.7" (322.6mm) This is the shortest possible turnout length. Measured from the end PC board tie to end PC board tie. Outside Radius 36" R (914.4mm) The radius of the outside route of a curved turnout. Inside Radius 30" R (762mm) The approximate radius of the inside route of a curved turnout. H - 0.0625" (1.6mm) The actual size of the tie.